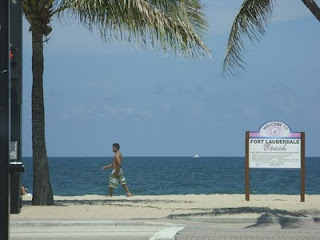 For most snowbirds, this is one of the first views that you get of Fort Lauderdale Beach. The oil hasn't gotten here, yet. It is still clean, there are still people coming to the beach. It is summer, and while it is what most people would consider hot, it has been hotter in the big cities of the Northeast. The summer isn't the time most people expect to go to Florida, this is a "cold weather destination" - people come here when their own places are miserable and it is beautiful here. I call this our secret season. This is when the locals come out to play and bring a few select friends. The water is still blue and warm. The breezes are still refreshing. The sand still gets between your toes. You can walk the beach without having to step over too many college kids from Michigan and Iowa and you can get a seat at any restaurant you like without too much trouble. Sure it rained all weekend, but this is the Wet Season. There are four areas to watch in the Caribbean Basin and the Gulf of Mexico, but nothing is going to amount to anything here yet. It may later, but for now it is all clear. After all, its nice to go outside dressed like that guy and walk out to the beach on a "Beach Day" and play tourist. Millions have. Millions will. Beautiful!!! I love the beach! I'm sure I've asked this before but I don't remember what you said-How close are you to the beach? I like the new background!! Thanks Pat! I am only about 2.5 miles from the beach, its a short ride in the car or better on a bike. I decided to play around with the templates that they had on here. Something different!